The Messerschmitt Me 309 was a prototype German fighter, designed in the early years of World War II to replace the Bf 109. Although it had many advanced features, the Me 309's performance left much to be desired and it had so many problems that the project was cancelled with only four prototypes built. The Me 309 was one of two failed Messerschmitt projects intended to replace the aging Bf 109, the other being the Me 209 of 1943. The Me 309 project began in mid-1940, just as the Bf 109 was having its first encounters with the Spitfire in the Battle of Britain, the first aircraft to match the 109 in speed and performance. Already, Messerschmitt anticipated the need for an improved design to replace the Bf 109. The Reich Air Ministry, however, did not feel the same urgency, with the project given a low priority, resulting in the design not being finalized until the end of 1941. The new fighter had many novel features, such as tricycle landing gear (with a nosegear strut that twisted through 90° during retraction, to a "flat" orientation under the engine) and a pressurized cockpit, which would have given it more comfortable and effective high-altitude performance. Each of the new features was first tested on a number of Bf 109F airframes, the V23 having a ventral radiator, the V31 with a radiator and tricycle landing gear, and the V30 having a pressurized cockpit. Low government interest in the project delayed completion of the first prototype until spring 1942, and trouble with the nosewheel pushed back the 309's first flight to July. When it did fly, the Me 309's performance was satisfactory – about 50 km/h (30 mph) faster than a standard Bf 109G – but not exemplary. In fact, the Bf 109G could out-turn its intended replacement. With the addition of armament, the aircraft's speed decreased to an unacceptable level. In light of its poor performance and the much more promising development of the Focke-Wulf Fw 190D, the Me 309 was canceled. In an attempt to revive the project, initiated in response to a 1941 Reich Air Ministry requirement for a new Zerstörer (destroyer) to replace the Bf 110, Messerschmitt's response was the Me 609. In order to meet the requirement of a new design in a minimum of time and with a minimum of new parts, the failed Me 309 project would form the basis of the new fighter. The Me 609 would have joined the two Me 309 fuselages with a new centre wing section. Only the two inner wheels of the joined Me 309's main landing gears would have been used and would retract into the centre section. This resulted in an unusual four-wheel arrangement. The Me 609 would have had its cockpit in the port fuselage, the starboard being smoothed over. Two versions were planned: a heavy fighter with four or six 30 mm MK 108 cannon, and a Schnellbomber (light bomber) variant with two 30 mm MK 108 cannon and a bombload of 1,000 kg (2,200 lb) carried beneath the fuselages. By the time designs were being ironed out, the revolutionary Me 262 turbojet negated the need for further piston-engined fighter design In 1943, Messerschmitt made one last attempt at creating a replacement for the Bf 109 in the form of the Me 209-II. It was essentially a modification of the existing 109 airframe, Messerschmitt designers not wanting to invest the time and trouble in a new design like the Me 309. This kit was willed to me by a fellow modeler that died of cancer years ago. It has a $17.00 price tag still on the bag. The kit came in a cello bag inside a larger zip-locked cello bag. 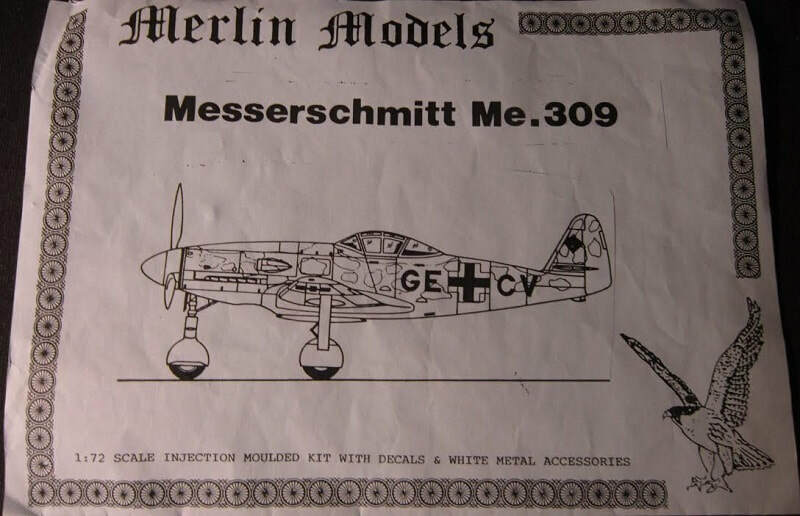 The header sheet says that Merlin Models was located in Newcastle, UK at some time in the past. I cannot find any mention of them any place on the internet and therefore assume that they must have gone out of business. The bag contains on chalk-white tree of parts, loose chalk-white fuselage halves and wings, a clear canopy part and 7 white metal parts and the decal sheet and instructions. 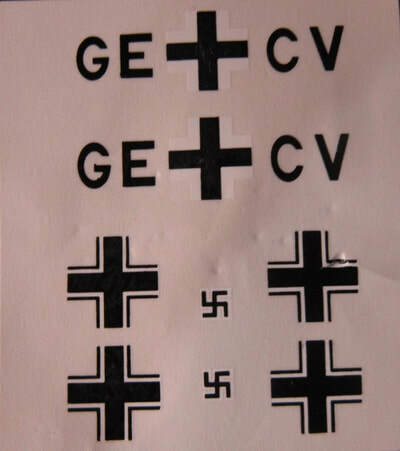 The header sheet is 8 1/2" x 11" with a black and white profile of the Me-309. It is medium green over light-blue undercarraige with grey mottling on the sides. It carries the black fuselage code GE + CV on one side. The back side is blank. The instruction sheet is slightly larger at 8 1/2" x 12" printed on both sides. 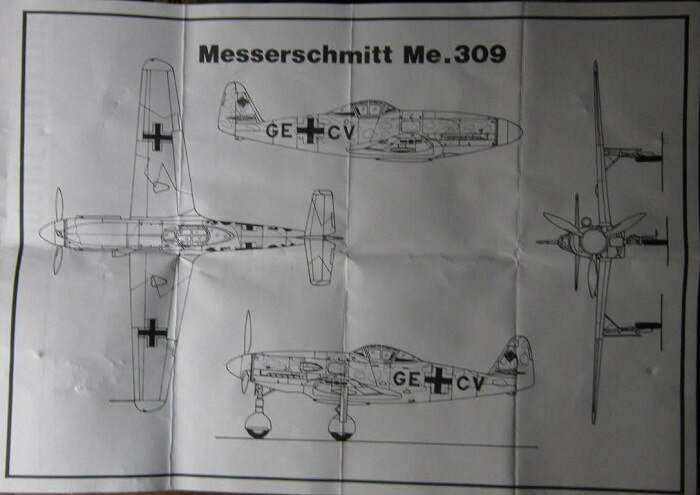 The face side begins with a one paragraph history of the Me-309 over text telling you the sequence of assembling the parts. 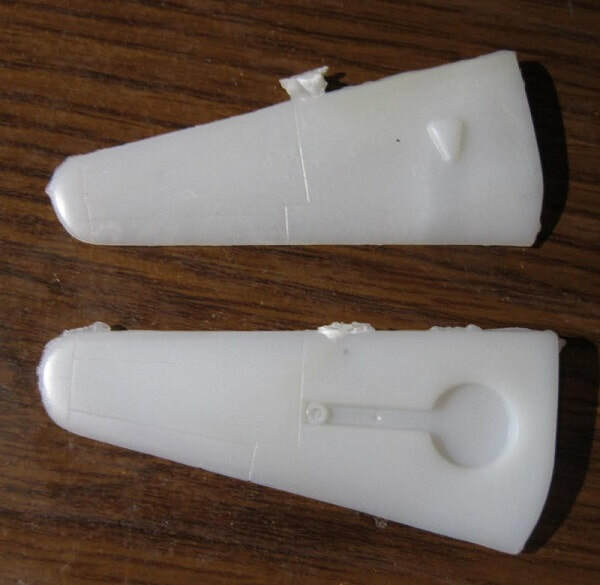 This is a limited run injection molded kit. There are no parts trees illustrations and the parts do not have number tabs next to them. 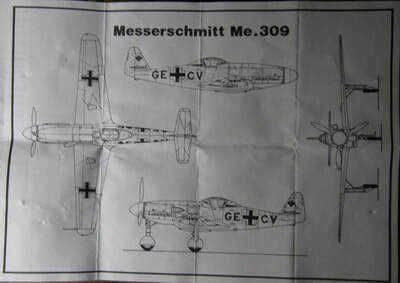 The reverse side of the instructions has a 4-view line drawing of the Me-309 in the header sheet scheme. ​Next is the 2 parts of the fuselage halves and the wings in chalk-white. 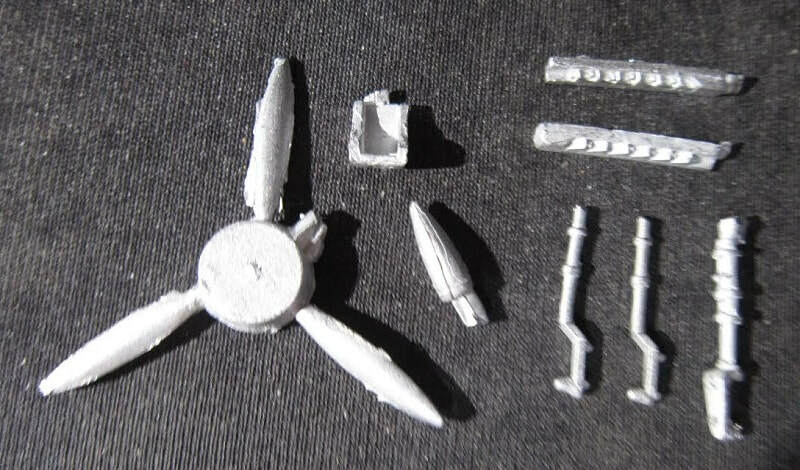 ​The white metal parts consist of: the propeller, gear legs, seat, exhaust pipes and air intake. ​The final part is the clear cockpit canopy. The decal sheet has a frosted tissue on it's face to protect it. ​This is a pretty basic short run kit and well within the skills of the novice modeler and a definite weekend project.